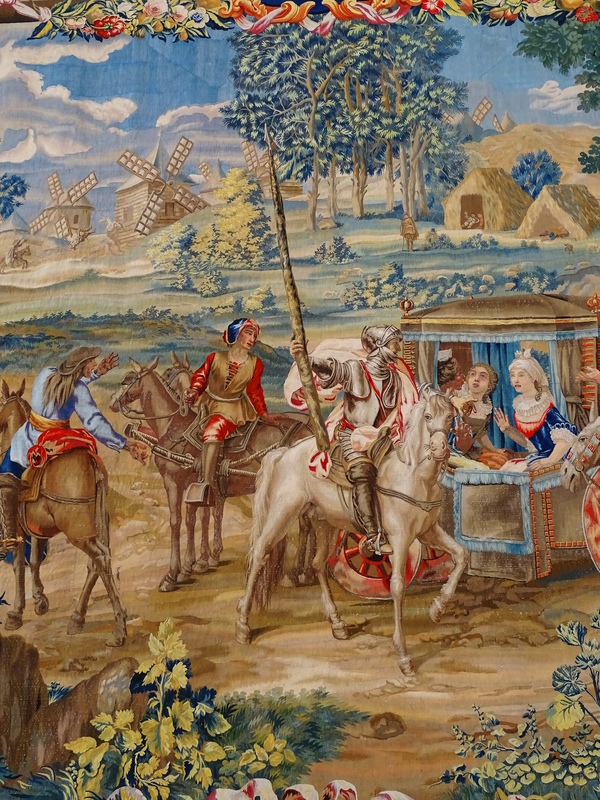 and depict in detail the life and adventures of Don Quixote. 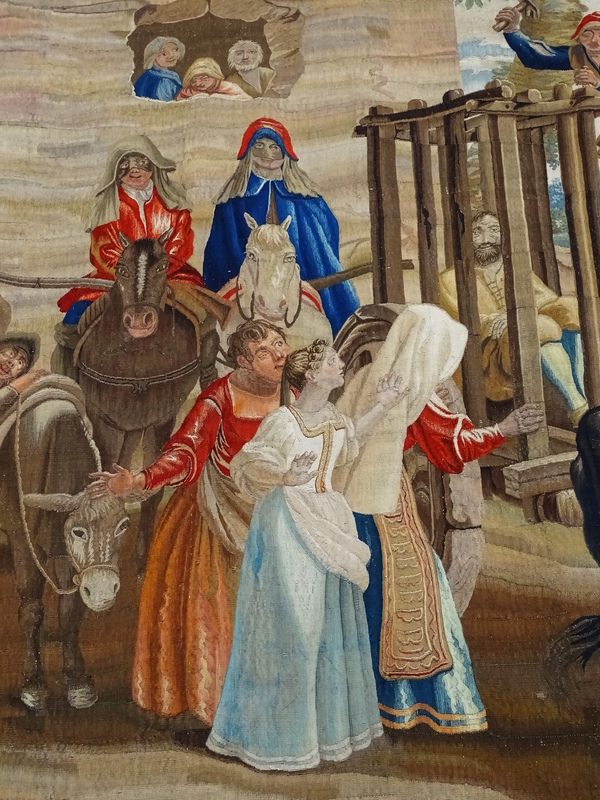 I included a close-up so you could see the intricate stitch detail in these remarkable tapestries. 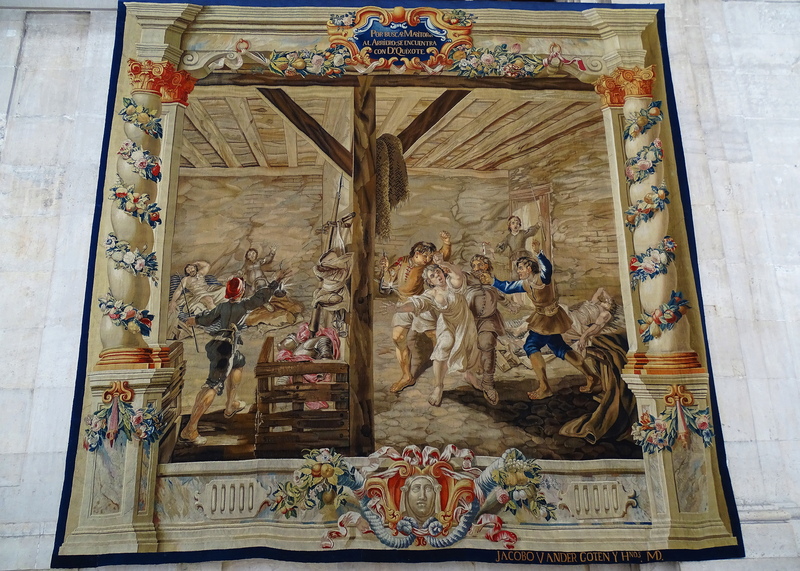 They were woven sometime in the early 1700’s by the Madrid Tapestry Factory which was founded by King Phillip V. Goya worked for a time in this factory creating designs. 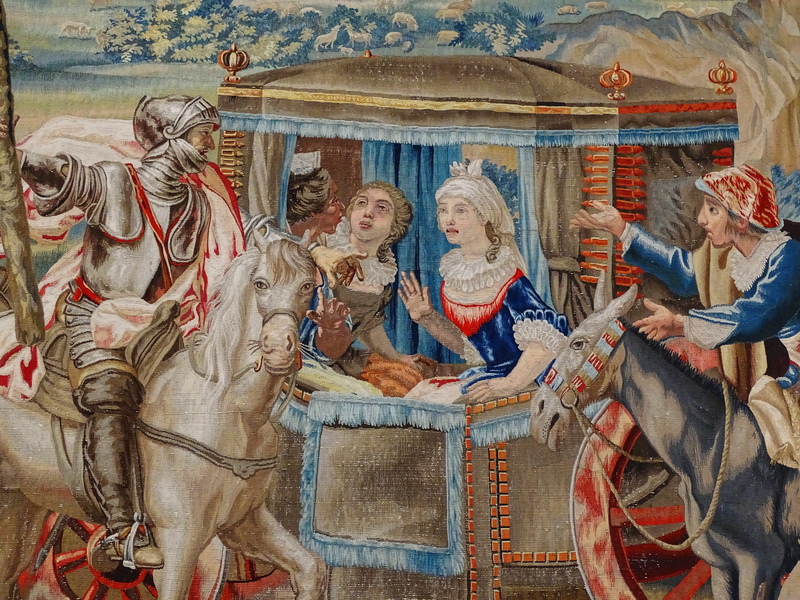 How incredibly vivid the tapestry colors are and what exquisitely detailed faces! I can only gasp in amazement at the skill of the embroiderers. I know, the faces blow me away. How could they capture emotions in stichery? I don’t know, but they did, and it is remarkable. If BTW u going Barcelona or any other city in Spain or Paris, let me know! Nice to see that retirement can be lived so happy and making happy others (us). Thanks for sharing u discovers. I Love tapestries. Beautiful images. Thanks, Cindy! 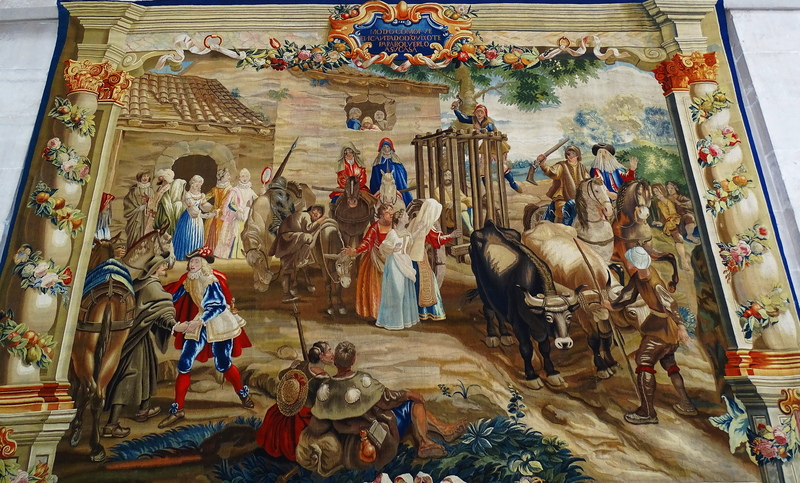 Incredible tapestry!! I can’t even imagine what my eyesight would be after weaving even one of these. Just beautiful! Oh yes!! Fingers too. What we endure for beauty.. I wish you a wonderful new week. Seeing this makes me miss Madrid. When I lived there I visited the Palace quite often. Did you visit the Cathedral too? View from the top of the towers is amazing!! Thanks for posting. I wish I had been there with you…a very gorgeous creation! Thanks for sharing such a beauty! Hugs! Haben Sie eine wunderbare Woche und danke mein Freund. Stunning work. Just to think that it was all done by hand. That must have taken forever. And such intricate detailed work too. It is amazing. The artistry in the weaving, the skill, patience, and the color… yadadada……etc. I’ve always been amazed by tapistries, Cindy. In many ways, the skill in producing a great one equals or exceeds many of the grand masters in painting. These are beautiful. Hugs, Cuz ! 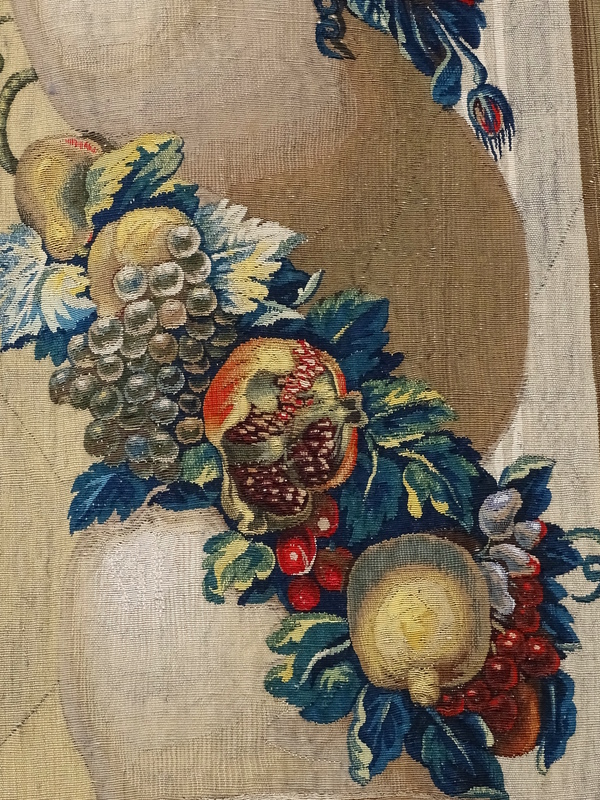 Yes, because paint you can brush on, each stich here involves such detail. I have no idea how they captured the emotions on people’s faces with thread. It is remarkable. Love it! I have a Dali of Don Quixote. His story fascinates me. Fantastic photos of great works of art! Thank you for sharing, Cindy. Cindy, you won’t believe this, but why would I make this up? I was singing, “I am I, Don Quixote, Man of la Mancha!” I was in my own little world singing while picking automobile parts and putting them into bins to send out to Advance Auto stores. It was a hot, humid warehouse day so I pictured my Spring break trip with Spanish Club and started singing. The tapestries are amazing. The are truly works of art..
Cindy: Thank you for sharing these. I love them. And not just because, as a teenager, I very much identified with Don Quixote! The tapestries are beautiful. Rebellious contrarian, tilting at everything that looked like a windmill. Yes, which makes him wonderful indeed! Love the detailed work– brilliant photos (again!) Cindy! So fun to get in on your travels!!! I love the story with Don Quixote. 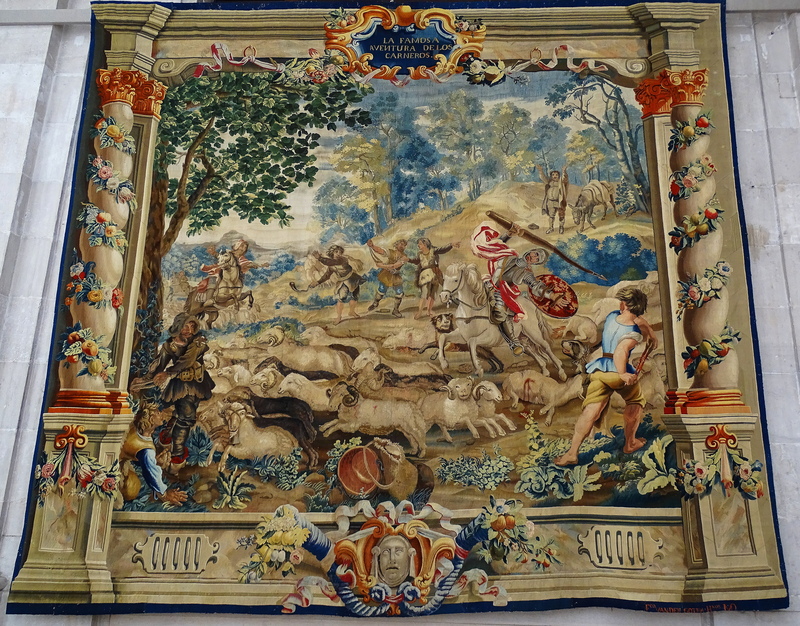 And I love these tapestries. They are amazing pieces of art. 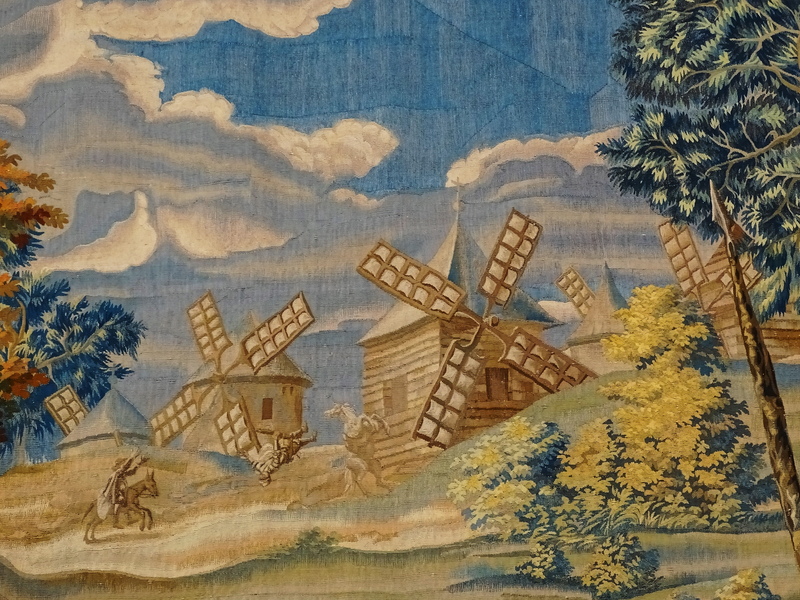 These tapestries are astounding! The detail, color, and oh so many. I liked that you included a close-up for the detail, too. Wonderful, Cindy — thank you. I was in Mallorca recently and posted about it and I didn’t remember any windmills. But I googled it and now see. Fascinating! Exquisite work. You’d need good eye-sight to do all that fine weaving. And lots of hand-eye co-ordination! the facial expressions are amazing, indeed! such patience…I wonder how many hands stiched these?! …there is such beauty in the thought of the care and patience in creating these tapestries…Thank you for sharing, Cindy!